Sometimes only part of the fence needs to be repaired, rather than replacing the whole thing. Yes, you have a very tough decision if you are deciding between replacing a fence and repairing a fence. In fact, sometimes it is cheaper to just completely replace the fence. Replacing your fence also allows you to change the style and the design, but you already know it isn’t going to be cheap. 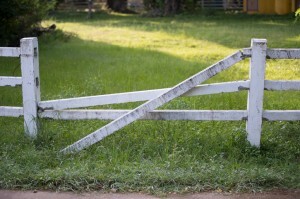 Let’s take a closer look at fence repair and when it is worth it. Before running out and buying a new fence, it’s important to know some of the common problems that can have easy solutions. While wood fences certainly have aesthetic appeal, you will have to constantly monitor it for repairs. The weather and insects can really take a toll on your wood fence, and wood fences are known for warping, splintering, and discoloration. But, you can generally perform fence repair by patching small holes and cracks with putty or wood filler. If boards are warped, you can replace the specific boards instead of the entire fence. If your fence is made of vinyl, you won’t come across a lot of situations where you need to repair your fence. But, vinyl can still be subjected to damage from snowstorms. Vinyl can also crack if heavy debris or equipment runs into it. You might only need to replace a single picket, but sometimes you may need to replace an entire section. If you’re debating between buying a new fence or repairing your current fence, most of the time it will come down to time, effort, and money. If the costs of a new fence are similar to those of replacing a fence, the effort of replacing your fence might not be worth it. One rule of thumb is that if you have to replace more than 20% of the pickets or panels in a fence, it’s time to get a new fence. But as we mentioned above, sometimes all you need is fence repair when you only have to replace a few pickets or panels.